Just read an interesting article by @copyblogger ‘s Brian Clark about the Six Characteristics of Highly Persuasive Stories. And just this week I was coaching a client on the importance of #2 The Importance of Vivid Imagery. I learned about the importance of this storytelling element when I was studying comedy improv. Over and over again we would be encouraged to use specific details to help create a connection to our audience and help them engage with our characters and our scenes. 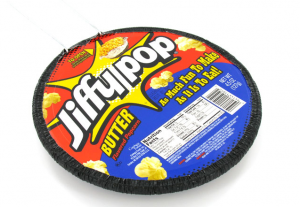 Don’t offer your scene partner some popcorn, we’d be told: offer them some Jiffy Pop, Cracker Jacks, or Poppycock! When you think of those snacks I’ll bet you have associations or memories with some or all of them and not only that, I have created a free multimedia presentation in your brain on my behalf by helping you conjure specific pictures in your mind’s eye. If I’m watching the scene I now have an added emotional connection to what is unfolding on stage because of this small detail. How many times have you given examples in your presentations of Company ABC (yawn) or Johnny in Sales (really? How many Johnny’s do you know post 1950?). Why not use interesting details to set up an example for your team of how to resolve a common customer service issue? Give the client a quirky name like Wacky Applesauce Inc. (which will pull a free smile/giggle out of your normally disengaged audience) and make your customer service rep Jamal. Or Anita. Or Ling. Tell me that the call comes in at 4:53 on a rainy Friday afternoon before a long weekend. These details help me to track your story by building a vivid picture in my mind. So the next time you want to set up an example to illustrate a theory/policy change/current challenge use at least two of the five senses of sight, sound, smell, taste, and touch to help you generate just enough detail to help your audience zoom-in to the story.